SPAD XIII at the United States Air Force Museum shown in 94th Aero Squadron (Pursuit) markings. Aircraft is marked as Eddie Rickenbacker's aircraft. 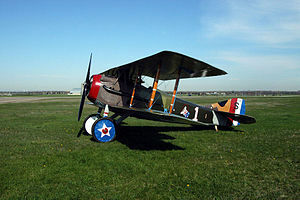 The 94 FS is one of the oldest units in the United States Air Force, first being organized on 20 August 1917 as the 94th Aero Squadron of the United States Army Air Service at Kelly Field, Texas. The squadron deployed to France and fought on the Western Front during World War I as a pursuit squadron. It took part in the Champagne-Marne defensive; Aisne-Marne offensive; St. Mihiel offensive, and Meuse-Argonne offensive. In 1924, it was consolidated with the 103d Aero Squadron (Pursuit). The 103d was largely composed of former members of the French Air Service Lafayette Escadrille (from the French Escadrille de Lafayette). This was a squadron of American volunteer pilots who had joined the French Air Service prior to the United States entry into the war on 6 April 1917. In July 1926, with the disestablishment of the U.S. Army Air Service, the squadron became part of the U.S. Army Air Corps (USAAC). In June 1941, the squadron became part of the renamed U.S. Army Air Forces (USAAF). During World War II the unit served in the Mediterranean Theater of Operations (MTO) as part of Twelfth Air Force as a P-38 Lightning fighter squadron, participating in the North African and Italian campaigns. In September 1947, it became part of the newly-established United States Air Force (USAF). During the Cold War it was both an Air Defense Command (ADC) fighter-interceptor squadron, and later as part of Tactical Air Command (TAC). It was one of the first USAF operational squadrons equipped with the F-15A Eagle in January 1976. With the disestablishment of TAC in 1992, it was assigned to the newly-established Air Combat Command (ACC). The 94 Fighter Squadron (94 FS) is tasked to provide air superiority for the United States and allied forces by engaging and destroying enemy forces, equipment, defenses or installations for global deployment as part of the 1st Fighter Wing. 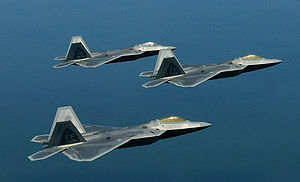 The squadron flies one of today's most advanced air dominance fighters, the F-22A Raptor, being the USAF's second operational F-22 squadron in 2006. 94 FS aircraft, like other aircraft from the 1st Fighter Wing, have the tail code "FF". The 94th Fighter Squadron has a long history and traditions that date back to World War I. The squadron was activated at Kelly Field, Texas, on 20 August 1917 as the 94th Aero Squadron. On 8 April 1924, the unit was consolidated with the 103d Aero Squadron which was organized on 31 August 1917. Air Service Pilots of the 94th Aero (Pursuit) Squadron in France, June 1918. Of this group, two were killed in action and Captain Edward V. "Eddie" Rickenbacker (center row, 6th from the left) became America's leading ace with 26 aerial victories. On 30 September 1917, two officers and 150 enlisted men left Texas for France and were sent to seven different aircraft factories for maintenance and repair training. 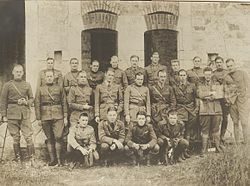 In April 1918, the 94th was reunited and stationed at the Gengault Aerodrome near Toul, France, where it began operations as the first American squadron at the front. It was placed under the command of Major Raoul Lufbery, an ace pilot and veteran of the Lafayette Escadrille. As the first American squadron in operation, its aviators were allowed to create their squadron insignia. 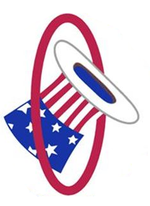 They used the opportunity to commemorate the United States' entry into World War I by taking the phrase of tossing one's "hat in the ring" (a boxing phrase to signify one's willingness to become a challenger) and symbolizing it with the literal image of Uncle Sam's red, white and blue top hat going through a ring. On 14 April, Lt. Douglas Campbell and Lt. Alan Winslow downed two German aircraft. These were the first victories ever scored by an American unit. No 94th pilot achieved more aerial victories than 1st Lt. Edward V. "Eddie" Rickenbacker, who was named America's "Ace of Aces" during the war. In his Nieuport 28 and later his SPAD S.XIII, Rickenbacker was credited with 26 of the squadron's 70 kills during World War I. By the end of hostilities, the 94th had won battle honors for participation in 11 major engagements and was awarded the Croix de Guerre with Palm. The squadron was assigned to the 1st Pursuit Group based at Toul (5 May 1918), and subsequently at Touquin (28 June 1918), Saints (9 July 1918) and Rembercourt (1 September 1918). Rickenbacker took command of the squadron on 25 September, at the start of the Meuse Argonne Offensive, and retained it through the end of the war. Another flying ace of this squadron was Harvey Weir Cook. The 103d Aero Squadron constructed facilities, December 1917 – 1 February 1918; with flight echelon originally composed of former members of the Lafayette Escadrille, participated in combat as a pursuit unit with the French Fourth Army, French Sixth Army, Detachment of the Armies of the North (French), French Eighth Army, and the American First Army, 18 February – 10 November 1918. On 8 April 1924, the 103d was consolidated by the Air Service with the 94th Pursuit Squadron. The squadron returned home in the spring of 1919, and after several moves, the 94th settled with the 1st Pursuit Group at Selfridge Field, Michigan, in July 1922. In 1923, the unit was re-designated the 94th Pursuit Squadron. The squadron stayed in Michigan for the remainder of the inter-war years, training in its pursuit role. The squadron flew 17 different aircraft during this period, culminating with the P-38 Lightning. One week after Pearl Harbor, the 94th moved to Naval Air Station San Diego, California. Expecting to see action in the Pacific, the squadron instead received orders for Europe. In the summer of 1942, the 94th and its parent group deployed under its own power to England, the U.K., via Canada, Labrador, Greenland, and Iceland as part of Operation Bolero. This marked the first time that a fighter squadron flew its own aircraft from the United States to Europe. In May 1942, all pursuit groups and squadrons were re-designated "fighter". In November the 94th Fighter Squadron entered combat in North Africa during Operation Torch. Based in Algeria, Tunisia, and Italy, the 94th again distinguished itself in combat by winning two Presidential Distinguished Unit Citations as part of the 1st Group. In addition, the squadron earned 14 Campaign honors, participating in almost every campaign in North Africa and Europe. 64 pilots of the 94th Fighter Squadron were credited with 124 Axis aircraft destroyed. The 94th produced a total of six aces in World War II. In April 1945 the 1st Fighter Group received two YP-80 jets for operational testing. The 94th Squadron's Major Edward LaClare flew two operational sorties in the YP-80 although without encountering combat. After the end of World War II, the 94th trained in the Lockheed P-80 Shooting Star, America's first operational jet fighter, and was stationed at March AFB, California. In July 1950, the group became the 94th Fighter Interceptor Squadron (FIS) and was eventually assigned to Air Defense Command (ADC), later renamed Aerospace Defense Command (ADC). After the P-80, the squadron flew several aircraft in the interceptor role, including the F-86, F-102 and F-106. In 1956, the 94th won the Worldwide Rocket Firing Meet held at Vincent AFB, Arizona. In the 1960s, the unit was among the first ready units sent to Florida during the Cuban Missile Crisis in October 1962. The squadron carried out combat air patrol missions off the coast of Florida, setting a record for F-106 hours and sorties. During the 1960s, the 94th, along with other ADC units, maintained an alert force in Alaska. With its supersonic F-106s, the squadron intercepted Russian bombers on missions over the Bering Sea. Then, in June 1969, with tensions mounting following the Pueblo Incident and the downing of an EC-121 electronic observation plane by North Korea, the squadron deployed to Osan AB, South Korea, for six months. On 1 July 1971, the 94th returned to the United States, changing home stations to MacDill AFB, Florida, as part of a realignment of the original First Pursuit Group. The squadron was designated the 94th Tactical Fighter Squadron, reassigned to Tactical Air Command, and reunited with the 27th and 71st Squadrons under the 1st Tactical Fighter Wing (1 TFW), flying the F-4E. The 94th assumed the duties of a Replacement Training Unit (RTU), providing F-4 aircrews for operational combat squadrons. In 1975, the 1st TFW moved to Langley AFB, Virginia, and began the 94 TFS flying the F-15A and F-15B Eagle, with the squadron becoming combat-ready in early 1977. In September 1992, the squadron was renamed the 94th Fighter Squadron (94 FS). The 94th Fighter Squadron did not deploy to Southwest Asia for the first Persian Gulf War, although many of its pilots and maintenance personnel did as augmenters to both the 71st and 27th Fighter Squadrons from the 1st Fighter Wing. The 94th successfully supported the UN-sanctioned Operation Southern Watch and Operation Northern Watch in Iraq with many deployments to Saudi Arabia and Turkey in the period leading up to the Iraq War. The 94th Fighter Squadron pilots repeatedly defeated Iraqi surface-to-air missiles (SAMs) and anti-aircraft artillery (AAA) attacks while enforcing UN sanctions, without loss or damage to a single aircraft. Since the September 11 attacks on the United States, the aircraft of the 94th have patrolled the skies of the East Coast of the United States. Additionally, the 1st FW traded AF Ser. No. / tail number 05-0084 to the 90th Fighter Squadron for tail number 05-0101. Tail 05-0101 is the current 1st Fighter Wing flagship and flies as part of the 94th Fighter Squadron. Squadrons either stood down on a rotating basis or kept combat ready or at a reduced readiness level called “basic mission capable” for part or all of the remaining months in fiscal 2013. This affected the 94th Fighter Squadron with a stand-down grounding from 9 April-30 September 2013. 1st Pursuit Group, 22 August 1919 to consolidation. Selfridge Field, Michigan, 1 July 1922 to consolidation. Barber pole#Aviation and space flight for insignia on aircraft. ^ Placement of the emblem on a white disc and approval of the motto was done in 1994. ^ This emblem was approved for the 94th Aero Squadron by the American Expeditionary Force on 18 November 1918. "World War I Aero Squadrons". Cross and Cockade Journal. Society of World War I Aero Historians. Vol. 5 (Number 3). 1964. It was approved by the Air Service on 15 November 1919, but approval was revoked on 6 May 1924. Eddie Rickenbacker, former squadron commander, had formed the Rickenbacker Motor Company and had trademarked the emblem, making it unavailable for use by the squadron. By the beginning of World War II, the car company had gone out of business and Rickenbacker cancelled the trademark. The emblem was reinstated on 9 July 1942. Maurer, Combat Squadrons, p. 318. ^ This emblem was approved for the 103d Aero Squadron by the American Expeditionary Force on 18 November 1918. "World War I Aero Squadrons". Cross and Cockade Journal. Society of World War I Aero Historians. Vol. 5 (Number 3). 1964. When approval of the Hat in the Ring emblem was revoked in 1924, the 94th Pursuit Squadron used the former 103d Aero Squadron emblem, first on a white disc, then on a white arrowhead, until 1942. ^ a b Robertson, Patsy (22 July 2010). "Factsheet 94 Fighter Squadron (ACC)". Air Force Historical Research Agency. Retrieved 28 August 2017. Gorrell, Col. Edgar S. (1974). History of the American Expeditionary Forces Air Service, 1917-1919. Series E: Squadron Histories. Vol. 12 History of the 94th Aero Squadron. Washington, DC: National Archives and Records Service, General Services Administration. OCLC 215070705. Gorrell, Col. Edgar S. (1974). History of the American Expeditionary Forces Air Service, 1917-1919. Series E: Squadron Histories. Vol. 16 History of the 103d Aero Squadron. Washington, DC: National Archives and Records Service, General Services Administration. OCLC 215070705. Guttman, Jon. USAS 1st Pursuit Group. Botley, Oxford, UK: Osprey Publishing Ltd., 2008. ISBN 1-84603-309-8. Woolley, Charles. The Hat in the Ring Gang: The Combat History of the 94th Aero Squadron in World War I. Atglen, Pennsylvania: Schiffer Publishing, . ISBN 0-7643-1427-0. Wikimedia Commons has media related to 94th Fighter Squadron.